Doctors hours are by appointment. Appointment times are set aside daily for ill pets that may need to be seen promptly. Emergency cases shall always receive top priority followed by patients with previously scheduled appointments. It is also possible to drop your companion off with us if your schedule is not compatible with an available appointment time. Please call us to schedule an appropriate examination time to minimize waiting and delay. All cats must be presented in an appropriate cat carrier or on a leash. We ask that small mammals be presented safely in an appropriate carrier. Cat and small dog carriers can be provided in advance if needed. We request payment at the time that services are rendered. For your convenience, we accept Visa, MasterCard, Discover, Care Credit, cash, and personal checks. We are a participating provider with CareCredit. You can apply online. The American Animal Hospital Association (AAHA) is an international organization serving veterinarians and members of their staff, who are engaged in the delivery of veterinary medical care to pets. 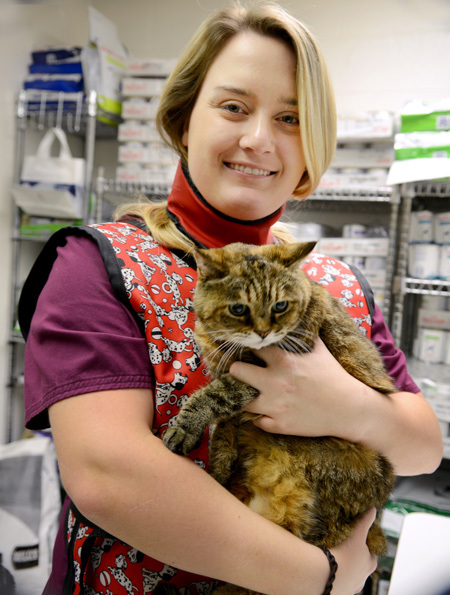 AAHA includes more than 27,000 veterinary care providers who treat companion animals. Established in 1933, AAHA is well known among veterinarians and pet owners for its standards for hospitals and pet health care. Over 3,000 veterinary hospitals voluntarily participate in the AAHA hospital evaluation program. Trained consultants regularly visit these hospitals to ensure compliance with AAHA’s standards for services and facilities. Individual veterinarians can also be members of AAHA.